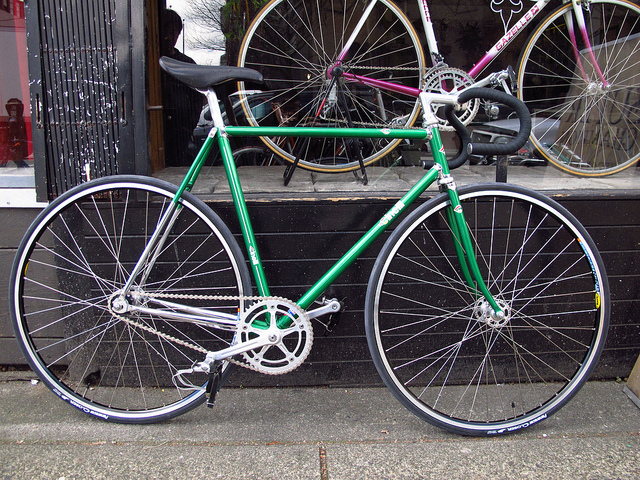 This is a mid-late 2000′s Cinelli Super Pista frame set we had hanging on our wallfor awhile. It served as a beautiful piece of eye-candy until our customer Tim walkedin and thought the same thing.We laced some Schwinn Paramount drilled out Campagnolo high-flange pista hubs to some Mavic Open Pro’s. Threw on some Campy pista cranks, Campy aero seat post, a Concor saddle, and Cinelli stem and Cinelli Pista bars. Here’s the result, and Tim’s got another fantastic track bike to add to his stable.